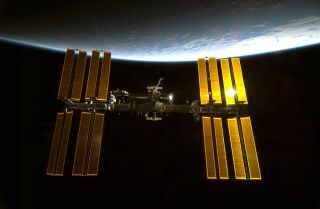 The U.S. government shutdown beginning today (Oct. 1) will shut down much of NASA, but the space agency is taking special measures to safeguard American astronauts currently living on the International Space Station. Veteran NASA astronaut Karen Nyberg and first-time space traveler Mike Hopkins can rest assured that when they call home to Mission Control at NASA's Johnson Space Center in Houston, someone will pick up the call. Today also happens to be NASA's 55th birthday — the space agency began operations on Oct. 1, 1958 — but it is unlikely any parties are planned. Most of NASA's 18,000 employees are furloughed today as a result of the government shutdown that went into effect after Congress failed to pass a budget late Monday (Sept. 30). Less than 600 space agency workers will be at work today, according to NASA's government shutdown plan. In a statement Monday, President Barack Obama said NASA "will shut down almost entirely," but that Mission Control would remain open. Byerly did not say how many Mission Control flight controllers would remain on duty, but the Johnson Space Center has experience working with a skeleton crew to maintain the space station. In the past, NASA has had to make do with a significantly smaller Mission Control team during emergencies, such as when hurricanes have threatened the nearby Texas coast. With NASA shut down, its public affairs operations, television and webcast channels and website, NASA.gov, are closed for business. "Due to the lapse in government funding, NASA Television will be unavailable to the Public, News Organizations, Satellite Service Providers and Cable Television Distributors," read a statement broadcasting continuously on NASA TV. "In addition, the NASA television feeds from www.nasa.gov also will be unavailable until further notice. We sincerely regret this inconvenience." In addition to the NASA TV and website freeze, NASA's widespread social media accounts — which the space agency uses to announce mission news and space discoveries — is also shut down. In space, Nyberg and Hopkins had been posting updates and photos on Twitter regularly to keep the public apprised of their work in space. Nyberg writes under the penname @AstroKarenN, and also uses Pintrest to post photos of her mission. Hopkins posts updates under the name @AstroIllini. However, Nyberg and Hopkins have not posted any messages or photos to Twitter since Monday. Nyberg launched to the space station in May and is due to return to Earth in November. Hopkins just launched to the space station on Sept. 25 and is at the start of a six-month mission in space. The two NASA astronauts are joined by Italian astronaut Luca Parmitano from the European Space Agency and Russian cosmonauts Fyodor Yurchikhin, Oleg Kotov and Sergey Ryazanskiy. Together, they make up the International Space Station's Expedition 37 crew.